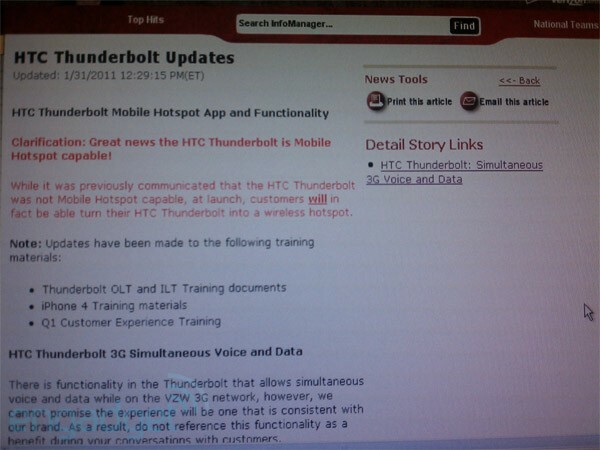 We received information from Verizon over the weekend suggesting that the HTC Thunderbolt would launch without the ability to act as a mobile hotspot for up to 8 devices, but boy can things change quickly. As of this morning, VZW seems to have flipped their stance on hotspot availability and are now welcoming in the feature, which is great news for anyone hoping to pick up the device. No word on if this was a technical issue or a company ruling, but we’re glad to see it back. And to see how the TBolt stacks up against the rest of the smartphone big dogs including the EVO and i*hone 4, check out these comparison charts.